Manage large-scale written exams from generation to evaluation using R/exams. Prepare a separate text file for each multiple-choice exercise. 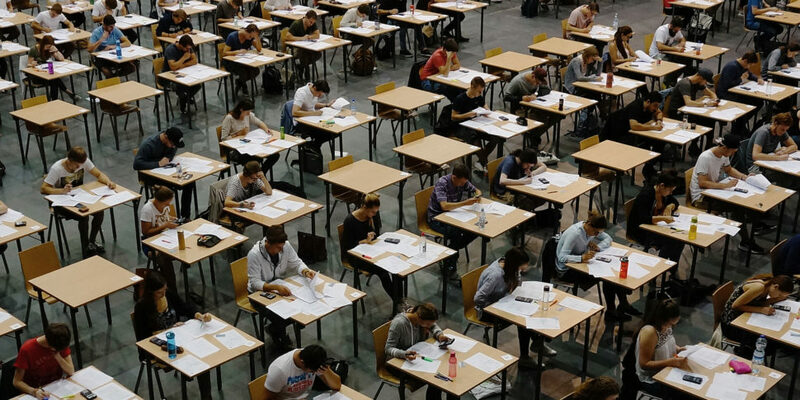 Using exams2nops() from R/exams, create (individual) PDF files for each examinee. Print the PDF exams, e.g., on a standard printer. …or for large exams at a print shop. Conduct the exam as usual. Collect the completed exams sheets. Scan all exam sheets, e.g., on a photocopier. Using nops_scan() from R/exams, process the scanned exam sheets to obtain machine-readable content. Using nops_eval() from R/exams, evaluate the exam to obtain marks, points, etc. and individual HTML reports for each examinee. Required files: Correct answers from Step 1, scans from Step 4, and a participant list in CSV format. Tutorial: Written Multiple-Choice Exams with R/exams.